The good news: St. Helens got its league softball season started on schedule Tuesday. The not-so-good news: The way the Lions started the game left something to be desired. The also not-so-good news: Hillsboro used its better start to win 13-3 at St. Helens. The consolation news: The Lions got sharper as the game went on, and they battled throughout, keeping the difference five runs till the late stages. The bottom-line news: It was a loss for St. Helens to launch Northwest Oregon Conference play, but it came to perhaps the best team in the league, and against the team that has been playing the best so far. Hillsboro raised its season record to 9-1 with the wire-to-wire win on a chilly, slightly damp day. The Spartans are ranked No. 1 in the state by Class 5A coaches and were No. 2 in the Oregon School Activities Association computer rankings going into the game. St. Helens (2-6 overall) spotted Hillsboro two runs in the first inning and four in the second for a 6-0 lead the Lions couldn't overcome. Some of those runs came at least in part because of miscues, mental or physical, by the Lions' defense. For example, in the first inning, the Lions had a chance to get a runner at second base as she tried to stretch a single into a double, but the attempt came too late. A little later, two runs scored on a wild pitch, with the plate not well-covered. In the Hillsboro second, late coverage of first base on a bunt contributed to the Spartans' third run. "I think the girls were a little super excited with our first league game," St. Helens coach Miranda Little said, "and it was a home game, and it was against Hillsboro, who we beat here last year, so there was just a whole lot of amped-up energy and we made a few mental mistakes that cost us a few runs early. "It took us a little bit to get our momentum." St. Helens sophomore pitcher Brea Paulson fought through the adversity to go seven innings. "Brea pitched fantastic," Little said. "A couple innings they hit her pretty good, but we should have been out of innings sooner than we were. Hopefully once our defense cleans up our pitchers won't have to pitch so much." The Lions, up against one of the state's top pitchers in junior McKenzie Staub, struck out 15 times, but also rapped out six hits. One of the biggest was an RBI double by senior Taylor Dow in the third inning. She drilled a first pitch fastball to center field to score Paulson, who had led off with a single, for St. Helens' first run. Junior Dessa Cooper then scored sophomore Kamryn Hubbs, who also had singled, with a mishandled blooper near the third-base bag. "I was a little nervous at the beginning of the game and on my first at-bat," Pence said. "I kept swinging at bad pitches. Then I got my head together the last two at-bats." Staub's pitching made it tough for the Lions to get a rally going. "She got me with the rise ball so bad," Hubbs said. Hilsboro was coming off its only loss after an 8-0 start. 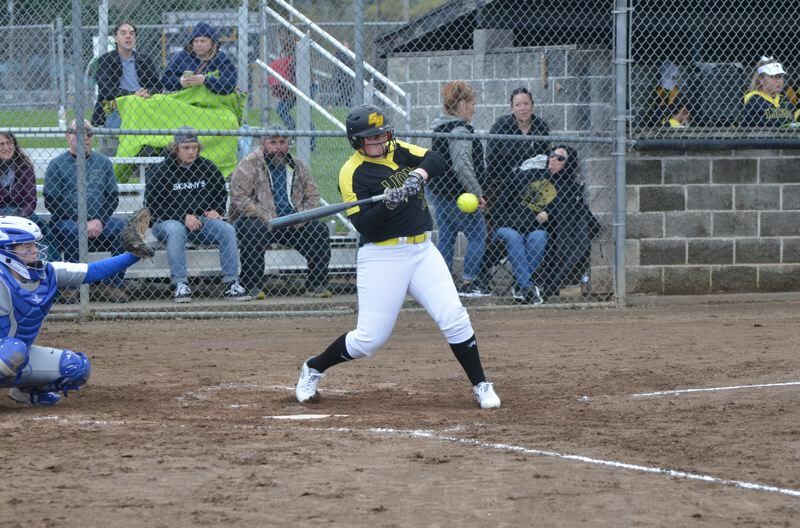 The Spartans fell 8-6 to 6A Newberg on March 26. "We came out ready to play," Staub said. "We were excited to play, to start league. We had a really good preseason, so we want to keep that going." The Spartans, who won the league a year ago with a 15-2 record, have reloaded with their new ace, who played shortstop last season. Staub also had three hits, including a triple and a double, with three RBIs and three runs scored in the leadoff spot. And the Spartans, despite having only one senior, look solid through the lineup. Seven players hit safety on Tuesday, and Hillsboro wound up with 13 hits and nine RBIs. Game 2 of St. Helens' NWOC season was set for Thursday at Parkrose, weather permitting. The Lions' next outings, based on the original league slate, will come Tuesday and Wednesday, both at home, with 5 p.m. clashes against La Salle Prep and Scappoose.